Hey, did everyone see Cody Harrington on TV? He won the sponsorship to go to the WJF! Very cool. We love the WJF. 1: Don’t move your feet. 2: Really don’t move your feet when you have to stand on the ricketty chair for the backcross comp. Check out www.thewjf.com for more WJF thrills! Went and saw the Circusoc/SURCAS production of R&J this week. A circus interpretation of Romeo and Juliet. It was really cool. It was great to see such a big cast doing so many different circus skills. I liked the juggling the best (big surprise). I also liked the group adagio. Just a reminder that the SJC 2010 DVD is available for purchase. We had a couple of problems with the shop not accepting payments for awhile but it should be good to go now. If you encounter any problems send us an email and we will get it fixed. Yay! The DVD for the Sydney Juggling Convention 2010 is finally finished. Pre-orders have been sent and orders made from the HalfBaked store will be sent out as they come in. Relive the excitment of the convention and see if you have a starring role along with our guests. The DVD includes the Sirkus Circus show featuring Wes Peden and Tempei Arakawa, the Renegade, Games and Gym Highlights. By the way, remember to check out Bob Carr’s article about the SJC in Kaskade Magazine. Nice pictures by Julian as well. Thanks guys! This last weekend has been very exciting. Talking of DVDs, the SJC DVD is coming together and should be out some time in April. I know it seems like forever but there is a lot of really good footage to be sifted through. Also, a review of SJC2010 will be in an upcoming edition of Kascade magazine. Thanks Bob! A whole lot of new tshirts are now available in our online store! Also a few old favourites are available in new colours. Yay! It has been a while since the SJC but I hope it’s not too late to say thanks to everyone who came. We had a great time and it was really exciting to see so many good jugglers. There will be a DVD for the convention which we will be producing over the next few months. There will be a pre-order product in the store soon. Talking of new products, there are several new t-shirt designs we are adding to the store over the next week or so. Time to update your wardrobe? CircusStuff (www.circusstuff.com.au) is also stocking a range of our shirts and badges so pick one up if you are visiting them in Tuggerah. One of the reasons we have been so long in adding any news is that we went to the New Zealand Juggling Festival. We have been wanting to go for years and were very excited to finally make it. We lived in luxury in a campervan, played late night poker in the gym, mastered Shamrock and did not have to organise a thing. It was quite good. Well, the SJC2010 is on tomorrow. We’re all very excited. Tour guide Shane has been taking our guests to beaches and things, so they are getting the Australian experience. No surfing koalas yet, though! It’s good to see that they’re all working for their pay as they became part of the HalfBaked sweatshop, pretty much as I write this. Also, the SJC is in the MX today. Nice picture boys! Well, the Sydney Juggling Convention is almost here! We’ve been busy getting last minute stuff organised and we can’t wait for next weekend! Jugglers from out of state and overseas are starting to arrive, so this week’s Newtown Juggling on Wednesday and Friday’s juggle in Hyde Park should be fun. Sirkus Circus tickets are selling fast. Don’t leave it until the convention to get tickets for your friends and family, you can buy them now from the HalfBaked Store, or at www.factorytheatre.com.au. With a great line up of performers including Tempe and MCP from last year’s Sirkus Circus and lotsa new stuff like our special guest Wes Peden it is going to be the highlight of the weekend. 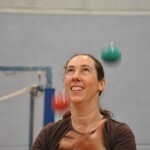 Check out www.sydneyjuggling.com.au for any last minute info about SJC2010 and Sirkus Circus. Peats Ridge Festival was lotsa fun again. I can’t believe how many people were there doing circus stuff! I got to see Circus Avalon do their show and it was good. I liked the juggling the best (of course), including the slappy trick. I’m sure I’ve seen that trick somewhere before…. I was going to hunt jugglers down and do some passing on New Year’s Eve but it started raining so we were forced to play poker all day in Nick’s van. Hopefully we’ll catch up at the SJC. Hope everyone had a good Christmas! HalfBaked are off to the Peat’s Ridge Festival for New Year. We went last year to teach workshops and it was lots of fun so we are very happy to be going again. Pictures will follow! One last reminder that early bird tickets for the 2010 SJC finish at the end of this year. They’ll still be available on the site in the new year, but the price goes up to $100. We much appreciate all those who preregister, it means we can bring you the best convention possible, and the SJC2010 is shaping up very well. It’s going to be a fantastic show with all our international guests and favourite jugglers but also lots of other circus acts, so there will be something for everyone.